First I want to share something I’ve been working on, to help keep you updated on all the latest happenings around here. We are now offering a weekly newsletter, sent right to your email at the end of every week. It will include snippets from that week’s posts and recipes, keep you updated on any current giveaways, and let you know about any other cool things going on. Plus we’ll share a little bit more, extra stuff from our everyday life that’s not included in the posts. Cool, huh?! For those of you who are already signed up for email updates, your information was transferred over to our new system, and you should have received our inaugural newsletter earlier this week. You will continue to receive email updates after each new post is published, just like before but it will look slightly different, plus the new weekly newsletter at the end of the week. I hope that you will stayed subscribed to both mailings, but completely understand if you prefer to opt out of one of them. For those of you who have not yet signed up, now would be a great time to do so! 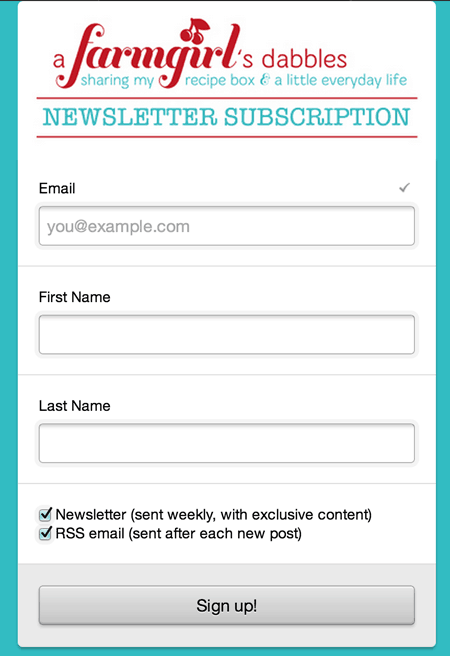 There’s a button on the sidebar that links to a subscription form, for you to choose the weekly newsletter and/or the email update. Or just click here. The form looks like this, and it’s easy peasy to get your updates started. Just enter your email and you’re good to go! And now let’s get back to that awesome salad!! It has been a real pleasure to read and cook from Lori’s book, The Recipe Girl Cookbook. 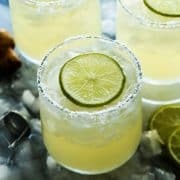 Just like the recipes on her popular blog, the ones in the book are welcoming and tasty, using ingredients and techniques that are easily attainable. 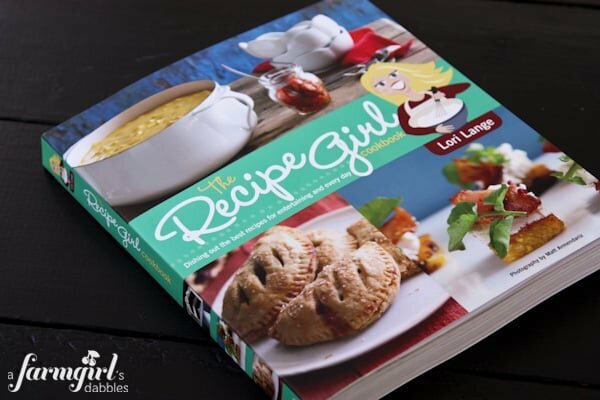 I especially like how Lori offers ideas to change up each recipe, and at the back of the book she includes ways to incorporate her recipes into themed menus. She completely takes the guess work out of planning a gathering or special meal. And the photos in the book? They are simply beautiful, as you would only expect from the work of Matt Armendariz, from Matt Bites. 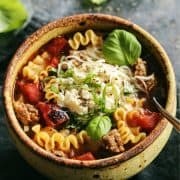 I had several recipes tagged from the cookbook, and it took me awhile to decide what to actually share with you. But then I looked out the window into our kitchen garden and saw the basil plants, all lush and begging to be used. I knew right then and there what I wanted to make. And eat. And share with you! This salad is a definite keeper, an all-family pleaser. It has chicken (meat! ), which automagically bumps up any salad in my husband’s rating system. It has Israeli couscous, those tiny little pasta bubbles that our girls love so much. And it’s loaded with the delicious summer goodness of sweet corn and fresh pungent basil. 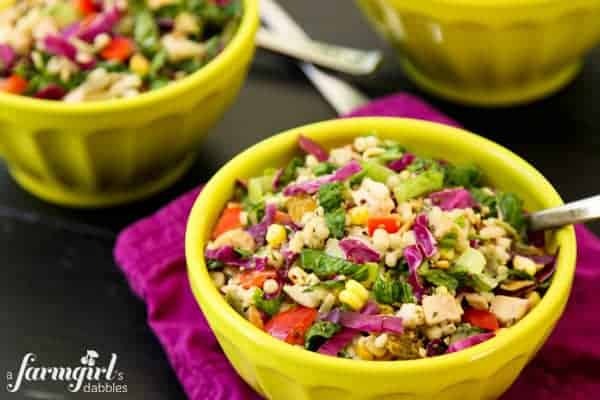 This recipe particularly peaked my interest with its use of raw sweet corn kernels, incorporated into the salad straight from the cob without cooking. I think I’ve found a new love. 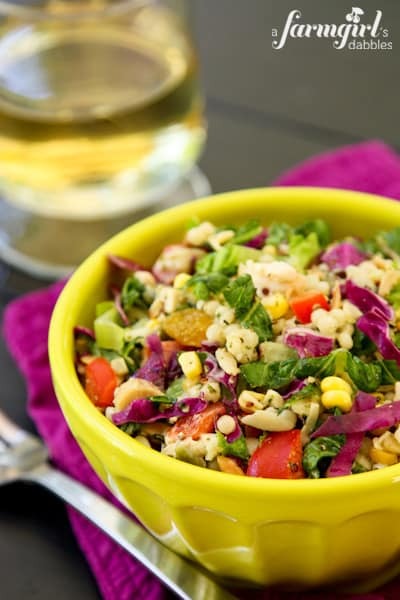 Why haven’t I been eating raw sweet corn in my summer salads all along?! Oh, and one more thing. Just go ahead and double the sweet basil dressing right away, to have some extra on hand. Drizzle it over fresh greens and use it as a veggie dip. It’s awesome! In a small bowl, whisk together all dressing ingredients. 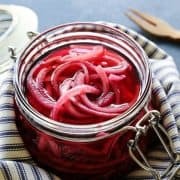 If the dressing seems too thick, whisk in more water, 1 teaspoon at a time, until you reach a consistency you’re happy with. It should be creamy and thick, but also pourable. Add the dressing and toss to coat evenly. Divide salad among 4 bowls to serve. Or, if you prefer, serve the dressing on the side so that individual eaters can add their own salad dressing. The dressing is so good, I highly recommend making a double batch of it. Whatever doesn’t get used on this salad can be used for other salads or as a veggie dip. Yum! Adapted just slightly from The Recipe Girl Cookbook by Lori Lange. 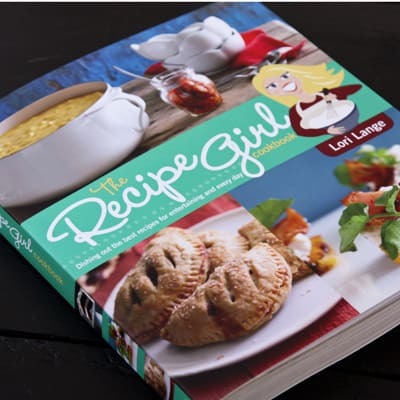 The Recipe Girl Cookbook is full of awesome recipes for everyday meals and easy entertaining. And you have the chance to win a copy, yay! Just use the widget below to enter. Giveaway rules: This giveaway is open to US residents 18 years and older. Giveaway will end at 11:59 pm CST on August 20, 2013. One winner will be chosen at random and then notified by email. Winner will have 48 hours to respond and claim their prize, or another winner will be selected. A farmgirl’s dabbles and Recipe Girl are not responsible for lost or undelivered emails. Disclosure: I received a copy of The Recipe Girl Cookbook for review purposes. All opinions are my own. Such a gorgeous salad. Love Lori’s book! The Panera Strawberry Poppyseed salad is one of my favorites! Since it`s summer, I love salads with a good amount of fruits! Like, sliced apples or strawberries! Always, good. Lately I am into fruit salads!! My favorite summer salad is just a good old-fashioned basic tossed salad with all the veggies I can pile on! I love putting strawberries, yellow squash, green bell pepper, red onion and cucumber in salad with a poppy seed dressing…soo good! My fav is a fresh caprese salad — for some reason I never make it at home, but always order if I see it on a menu when I’m out! Broccoli salad is my favorite salad. I loved wilted lettuce! It reminds me of my childhood, as it was a staple on our table! I love summer salads with fresh fruit and nuts, like strawberries and walnuts! My favorite would have to be a simple caprese salad. Fresh tomatoes, fresh mozzarella, basil – yum! 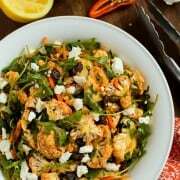 My favorite salad is one we call “Sizzling Salad” – grilled chicken, steak or shrimp, still hot on top of romaine lettuce, summer squash (and maybe other vegetables), freshly grated parmesan cheese and a touch of ranch dressing. Yesterday I made a quinoa, black bean salad with avocado, cherry tomatoes, and cilantro. I ate it with a spoon from the serving bowl for a while until I realized what I was doing. The shame of it was lost on me. I like a fresh cobb salad!! pasta salad with lots of extra fresh veggies is my favorite! 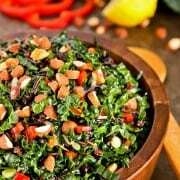 My favorite salad is Armenian fattoush salad. Caprese salad! Cobb salad! Any kind of salad really! This salad looks delicious! I have lots of basil that needs to be used. right now it’s a blt salad, I can’t help myself the bacon keep calling my name! Love romaine, dried cranberries, pecans, chicken, summer squash, tomatoes, tossed with a balsamic dressing! A yummy spinach salad with berries and balsamic vinaigrette. Tough question! I don’t usually ever make the same salad twice, but my current go-to for a side is a salad made up of equal parts cucumber, tomato, red onion, and (a little less than an equal part of) avocado, drizzled with a splash of olive oil and a good dose of balsamic vinegar. Yum! I don’t have a particular summer salad, it’s pretty much spinach and whatever fruit or veggies is on hand. Anything with corn or feta cheese is a win. Spinach salad with strawberries, goat cheese and candied walnuts is my favorite. My favorite summer salad is caprese pasta salad. My favorite salad is inspired by one that I had while traveling in China. It is a cilantro peanut salad. I make this salad for potlucks and everything I get hunted down by someone that has to have the recipe. It is simple and easy and cheap to make. And for those who love cilantro, is sure to become a favorite. Give it a try and I am confident you to will get asked for the recipe. Dressing * I admit to altering these four ingredients until I get the flavor I like best. Toss together and let sit for 20 minutes until it starts to wilt and then serve. I toss chopped apples and walnuts with chicken and drizzle with Cinnamon Pear balsamic and Roasted Walnut oil. Fresh flavors with a tart crunch! Another good recipe. Thanks Brenda. Love this one too. I love a salad with chicken, mandarin oranges, walnuts, and feta with a simple balsamic dressing. This looks like the perfect summer meal! My favorite summer salad is a grilled chicken salad topped with mandarin oranges. I love a good spinach and strawberry salad with some honey roasted almonds. Thanks for the chance to enter. Looks delicious. I’m made several of Lori’s recipes and they’ve all turned out great. Fresh spinach, poached egg, garden tomatoes, cucumber, carrot ribbons and avacado. Love sliced cukes and onions, with a tangy cream sauce. This salad looks wonderful–I love basil dressings! Greek salad. Heavy on the cukes and tomatoes. Sometimes I use romaine. Sometimes Israeli couscous. Sometimes chunks of bread for a panzanella. Always feta and olives and peppers and red onion. Oh how I love this salad and Lori’s book! I love chickpea salad with tomatoes, cucumbers, basil and a balsamic glaze drizzle. I make a Mandarine orange salad with almonds, craisins, and and apple cider vinegar salad dressing. So yummy!! My favorite summer salad includes charred corn and grilled mushrooms. I layer it atop a bed of romaine lettuce n some grape tomatoes. Mix up a simple honey-mustard dressing and dig in! For a complete easy meal, I top it off with grilled chicken strips. My favorite summer salad is Panzanella with garden fresh vegetables. 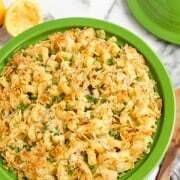 I found a BLT Potato Salad recipe that I loved! I love a fresh fruit salad with berries from our backyard! I love a good, fresh fruit salad during the summer! Thanks for the giveaway! I love quinoa salads with summer veggies. Your recipe looks like something I should definitely try! Our favorite salad is all from my garden, all raw vegetables, diced small, carrots, celery, radishes, kohlrabi, cucumbers, turnips or whatever you choose, mixed with a sweet creamy coleslaw dressing. Place in frig overnight. Family loves it! I love strawberry salads with poppyseed dressing. Start with tomatoes and basil; most anything added is acceptable! 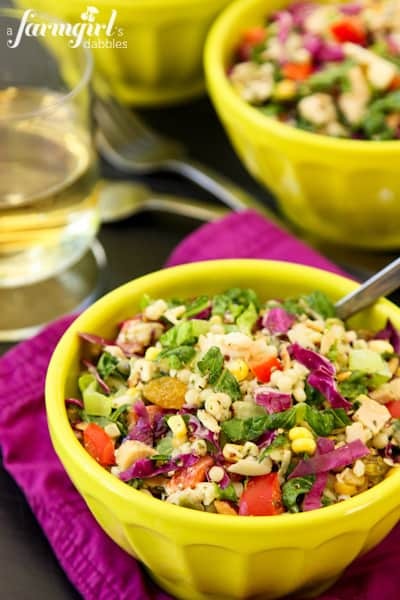 I love chopped salads and that basil dressing sounds wonderful! Love the looks of this salad! I love a good spinach salad with chopped eggs and bacon! I love a mixed spring green salad with walnuts, strawberries/raspberries/peaches/pears, and goat cheese. I love a nice, clean pasta salad in the summertime. My favorite one is a Greek-inspired orzo salad with fresh cucumbers, feta, kalamata olives, mint and a red win vinegarette. Yum-o! I am getting hungry just thinking about it. Grilled caesar salad – thanks! My favorite salad (not only in the summer) is a broccoli salad with olives, onions, cheese and more! Homegrown tomato, sweet pepper, onion and Lite Italian dressing. Sometimes I add fresh slivered garlic. 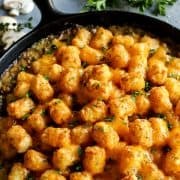 This looks so delish, can’t wait to try tonight! Thanks for another great recipe! I love grilled chicken and strawberry salad. I would have to agree with Kate and say a chicken salad with all the fresh garden veggies I could fit in there. Thanks for posting a great salad recipe Brenda. I was so hoping that you would post one. I love couscous and the fresh veggies in this salad. Thanks for the opportunity to win such a great prize! I love a minted melon ball salad in the summer. my favorite salad is chicken salad! Chicken pasta salad with red peppers, red onion, celery, olives and cucumber. Looks and sounds awesome! Potato Salad is my fave summer salad. 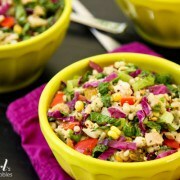 Definitely a corn salad with other fresh veggies and a light dressing! Love this salad and I haven’t had a chance to make it yet. I have the book so I won’t enter the contest…but your pics are beautiful! That salad looks amazing. 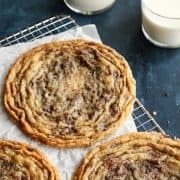 I’m going to have to make soon! My favorite salad is a summer pasta salad. I would love to win this cookbook! Thanks for the chance! Chicken salad are spiffed up with summer veggies from the garden. Thanks! This book looks so great! I would love to try the recipes, this salad looks divine! Thank you! This salad looks so good!! Lori did an amazing Job on her book and I have heard so many amazing things about!! Can’t wait to try out this salad! The salad looks great. I always appreciate your recipes. Thanks for the chance to win a new cookbook … just what I need – ha!